Each time that I have had an emotional outburst in nature, it has been under a tree. In fact, I can think back to many times in my life that I have started friendships, had large ideas, and realized something about myself all because of a tree. I’m not so sure that was the root of my fixation in venturing all the way out to Joshua Tree National Park, in Southern California, but the interest certainly did not hurt the motivated strides taken to arrive there. It was mid-day when we pulled into the park, my dad and I giggling over an intensely bee-swarmed bathroom at the entrance of the Welcome Center. We gathered our pamphlets and began driving through the different regions that comprise the park, as the land itself is the junction of two major deserts in America. We wove through miles of cacti and skyscrapers of piled rocks, stared up at mountains above us with patches of grassy hair upon them, and watched the hot asphalt road ahead shine with the contact of sunlight. 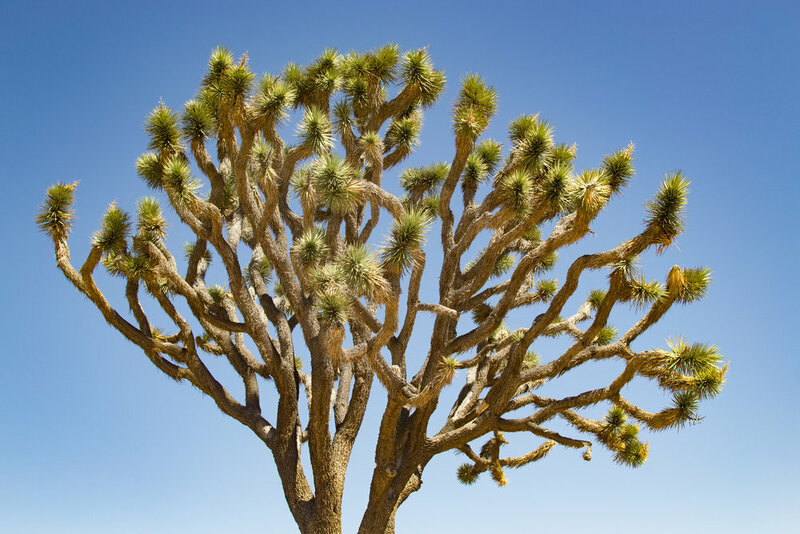 The park’s literature had shared that Joshua trees could grow to be up to well over 150 years old, and up to forty feet tall. Something about those numbers left me baffled, as I could not fathom anything without needles being able to flourish in these over-a-hundred-degree temperatures that were melting away at my sunscreen-ed skin, even from within the car. It was not until we were in the heart of the Mojave desert that we began to notice the trees appear around us, getting taller, more plentiful, and much more majestic the closer to them we drove. We stopped at the tree that you see here, the largest of Joshua trees in the park, and I was at a loss for words. I had never seen anything like this. I watched as the blue sky disintegrated into each of the many dried fronds, and I could see the bright green palms wishing to grow taller and taller above me. I don’t know what it was about that tree, but it brought me back to the feeling of every tree I had ever climbed, ever sat beneath for shade, ever leaned against for support. It reminded me of the time when I was little, living on a tall hill in a yellow house with red shutters, and I had asked my parents if I could plant a tree. They quietly smiled at me while I buried a pinecone, and continued to smile weeks later as I had misplaced that burial location and assumed that one of the tallest trees in our yard was the one I had grown. It reminded me of going to college and noticing people - who would later become some of my best friends - sitting in a tree together. I thought then that no one on the ground would ever look as beautiful as these carefree people looked intermingled with leaves. It reminded me of my first fall living in the north and how, even to this day, I can’t resist going out of my way to crunch a leaf under my shoe or gather the bright orange offering of the tree to press between pages of my textbooks. It reminded me of the feeling of loss each time I return home and see that the trees I have grown alongside in age are cut down, trimmed, and - at times - groomed into something they are not. Trees do not just remind me of memories. They remind me of me. They remind me of the manner that we all develop, sprouting from seed and growing in variety and branching into unrepeatable versions of branch and leaf. They are experience unfolding and life beholding and uncertainty certain by the force of nature. They are homes for some and aesthetically pleasing for others and life for many more than the ones who even notice that they exist. Looking at this tree in the day that I saw it, I can’t say that I associated it with many of these things. It is only now that I am removed from the desert that I can look at the forest within me and know that this is the case.